Idle Curiosity, Once More – Bow! Last Friday DOJ said that a former State Department employee was sentenced to 12 months of probation for illegally accessing more than 75 confidential passport application files, Assistant Attorney General Lanny A. Breuer of the Criminal Division announced. William A. Celey, 28, of Washington, was also ordered to perform 50 hours of community service by U.S. Magistrate Judge Deborah A. Robinson in the District of Columbia. On July 10, 2009, Celey pleaded guilty to a one-count criminal information charging him with unauthorized computer access. In pleading guilty, Celey admitted that between June 22, 2004, and July 15, 2004, he logged onto the PIERS database and viewed the passport applications of more than 75 celebrities and their families, actors, models, musicians, athletes, record producers, family members, a politician and other individuals identified in the press. Celey admitted that he had no official government reason to access and view these passport applications, but that his sole purpose in accessing and viewing these passport applications was idle curiosity. 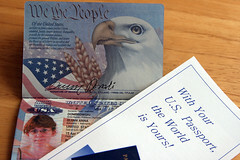 Celey is the sixth current or former State Department employee to plead guilty in the passport snooping investigation. On Sept. 22, 2008, Lawrence C. Yontz, a former Foreign Service Officer and intelligence analyst, pleaded guilty to unlawfully accessing nearly 200 confidential passport files. Yontz was sentenced on Dec. 19, 2008, to 12 months of probation and ordered to perform 50 hours of community service. On Jan. 14, 2009, Dwayne F. Cross, a former administrative assistant and contract specialist, pleaded guilty to unlawfully accessing more than 150 confidential passport files. On March 23, 2009, Cross was sentenced to 12 months of probation and ordered to perform 100 hours of community service. On Jan. 27, 2009, Gerald R. Lueders, a former Foreign Service Officer, watch officer and recruitment coordinator, pleaded guilty to unlawfully accessing more than 50 confidential passport files. Lueders was sentenced on July 8, 2009, to 12 months of probation and ordered to pay a $5,000 fine. On Aug. 17, 2009, Kevin M. Young, a contact representative, pleaded guilty to unlawfully accessing more than 125 confidential passport files. Young is scheduled to be sentenced on Dec. 9, 2009. On Aug. 26, 2009, Karak Busch, a former citizens services specialist, pleaded guilty to unlawfully accessing more than 65 confidential passport files. Busch is scheduled to be sentenced on Dec. 15, 2009. Mr. Celey is not the first one to admit to the snooping out of "idle curiosity." Read the whole thing here.